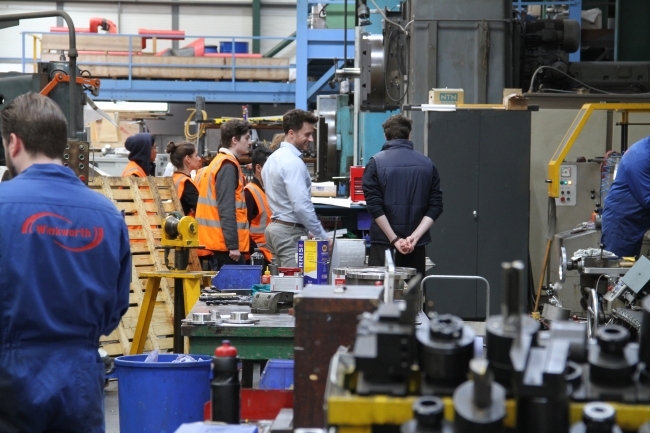 Leading manufacturer of industrial mixers and blenders, Winkworth, recently mixed industry with academia, by offering an insight into the manufacturing sector to the next generation of engineers. The firm has further strengthened their link to Portsmouth University by supporting a visit to their site by fifteen mechanical engineering students. The aim of the visit was to improve the students understanding of a manufacturing company, give a taste of what it’s like to work there and to provide them with the opportunity to see how they could apply their university education to the workplace. Winkworth has supported industrial placements for the last eight years. The recent visit included a talk from managing director, Grant Jamieson, together with a factory tour by design engineer Luke Gaiger. The party was joined by this year’s industrial placement student, Harrison Richmond, also a mechanical engineering student from Portsmouth University. The tour included a visit to the critical back office functions of planning and production control, as well as the engineering design office. Winkworth’s mixing test centre, where trials are run for customers, was also called on. Further into the tour, a presentation delivered by Tim Simpson, Winkworth’s technical sales director, enlightened the students on manufacturing processes and techniques, whilst outlining the types of products that are produced by Winkworth’s mixers. The day was rounded off by Winkworth’s HR manager, Jess Holt, delivering a presentation on career decisions within industry. Her presentation highlighted the advantages of working for an SME. Jess particularly urged the students to look beyond a brand name when considering a place of work, instead asking them to consider how their personalities and values align with a company, to ensure the best fit.